If you’ve already read my post about swimming with humpbacks, then you’ll know I didn’t just go to Tonga for the whales! We spent 6 nights on the island of Tongatapu which is the main island out of 169 smaller islands (36 of which are inhabited – quick fact for you!). What to do (besides swim with the whales)?? So I have to point out – Tonga is closed on Sunday’s! By this, I mean that it is a religious nation and everything pretty much shuts down on a Sunday; so, when you’re planning a trip make sure you take that into consideration! Pangaiamotu a small motu about 10 mins ferry ride from the mainland. It costs TOP$45 and includes lunch + return ferry. We spent most of the day over here and went snorkeling off the beach (we saw a sea snake eeek!) 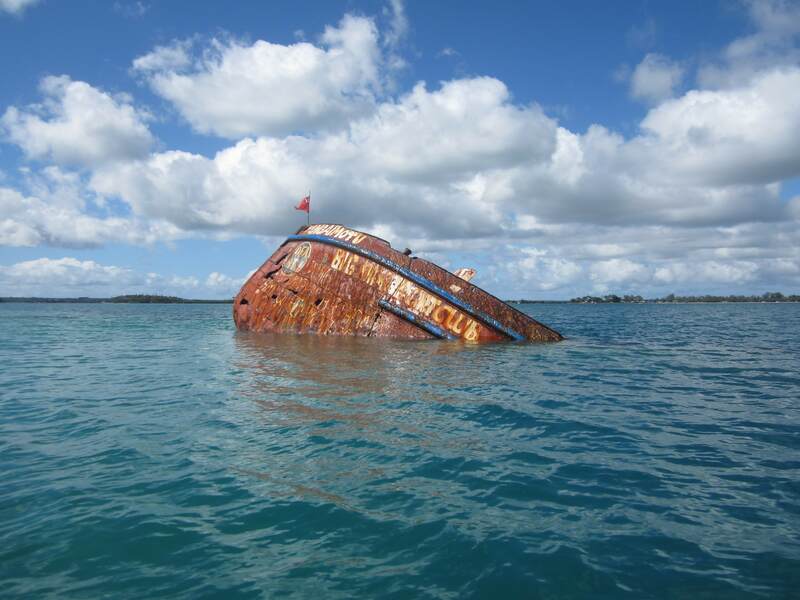 and around the shipwreck that sticks out of the water. Top tip: make sure you take your own snorkeling equipment as there is nowhere to hire it on the island. The island is pretty small takes about an hour to walk around. For the most part, you’ll be walking along the beach but there are parts you have to wade through the warm waters. Just make sure you wear sunscreen! We got rather sun burnt but it was a great way to see the whole island. You will have been given a voucher for food when you arrived on the island, so make sure you use this to get your lunch. The menu is pretty limited – think burgers and fish and chips. But it tasted good and really, that’s the main thing we want from food!! They also served pineapple Fanta, which we don’t have here in NZ but it is AMAZING and I honestly can’t get enough of it! Something else you can do on a Sunday: attend one of the local church services. There are hundreds (probably not literally, but still a lot!) of churches on the island, you’ll be spoiled for choice! The locals are very friendly and welcoming and will be more than happy to accommodate you at the service. We didn’t attend any so I can’t tell you what it will be like. What I can tell you is: Church is a formal event so it is important to dress appropriately – suits or trousers and a shirt for men, and a dress that covers the shoulders for women. 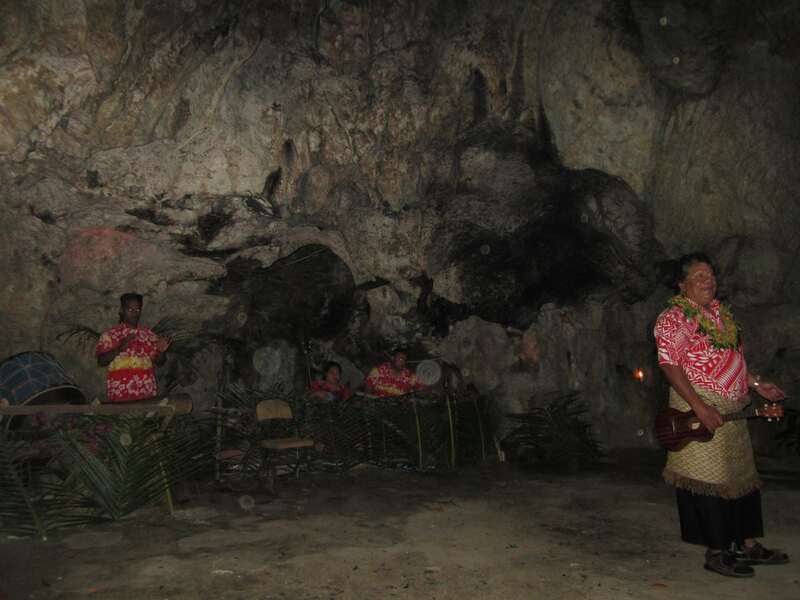 Tongan men wear their traditional tupenu (cloth wrap skirt, like a sarong or lava-lava) and women wear brightly coloured dresses. It is also common to see men and women also wearing a Ta’ovala, which is a mat worn wrapped around the waist. The island is small-ish! It took us the whole day to drive around but we did make multiple stops along the way. Though, if you’re not going to stop and check things out, there’s not really any point in making the trip! The roads are not good! Not good at all. The main, best sealed road does not go around the whole island; instead it’s a series of minor roads which are either sealed and full of potholes or dirt/mud tracks, which also slows the drive down. This is the spot Captain James Cook first landed when he visited the southern islands (Tongatapu & Eua) in 1773 and then again in 1777. 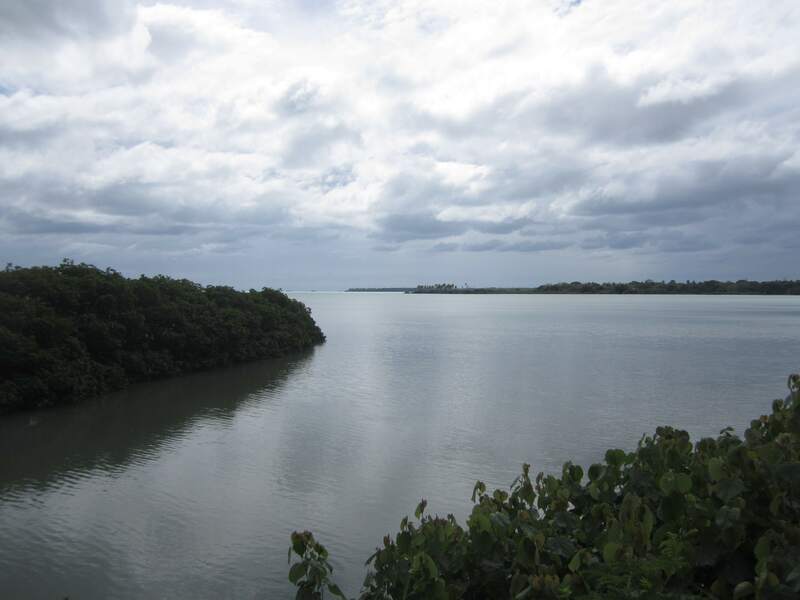 The landing spot is located along the main road heading towards the eastern side of the island. 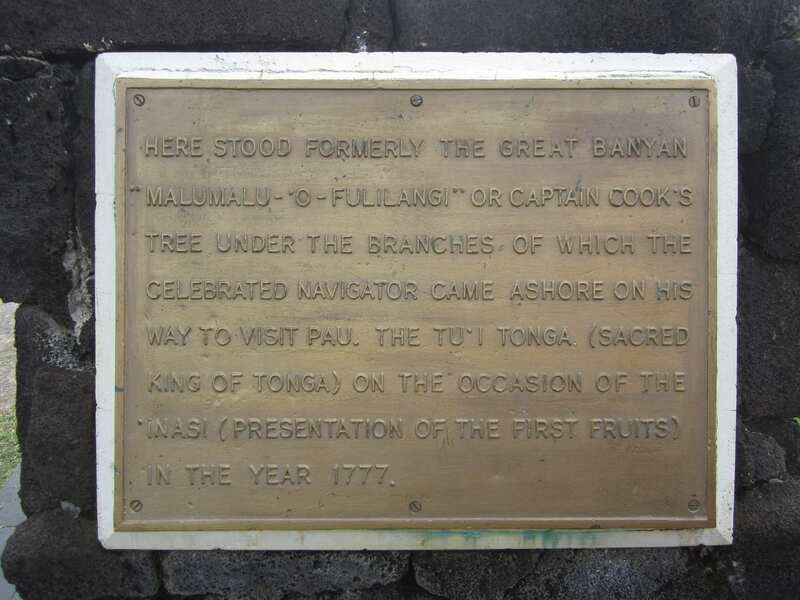 It tells the story of how he was met by the “friendly” locals (he named Tonga the “Friendly Isles”), not realising he was being lulled into a false sense of security, as the locals wanted to kill him and his crew and raid their boats. Fortunately for Captain Cook, there was some in-fighting among the villages and the plan was never carried out, so Cook and his crew were able to leave the islands none the wiser! Second Stop – The Terraced Tombs: The terraced tombs or Langi, took us AGES to find! We had to keep going up and down the same stretch of road as nothing is signposted, but eventually we found it down a side road that looked like a private driveway. Only the ancient Kings are buried here, the current dynasty are buried in a big park opposite the church in the main town. 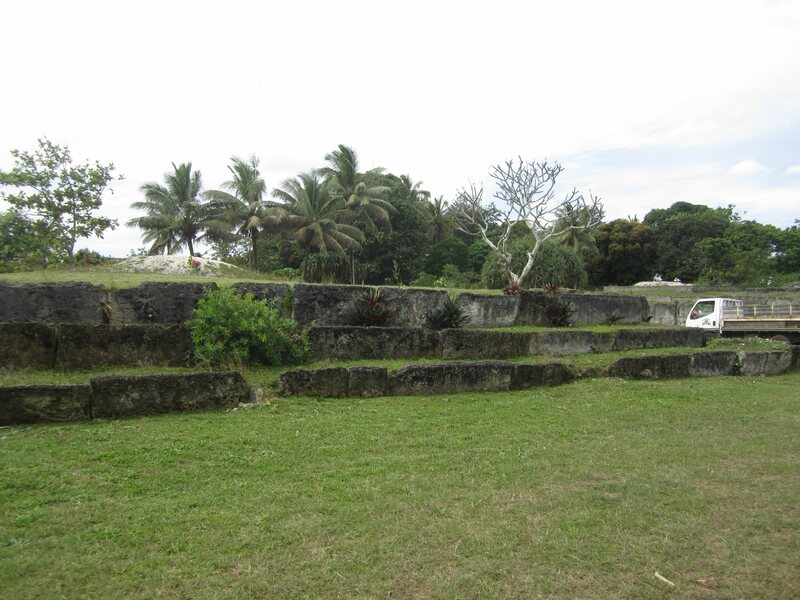 The terraced tombs are impressive structures, with big slabs of coral/stone around the sides and a grassy top. We only walked around the sides of them as it is a sacred site and I’m pretty sure people are not allowed to climb all over them. It’s a very small site, so we didn’t need to stop for long. 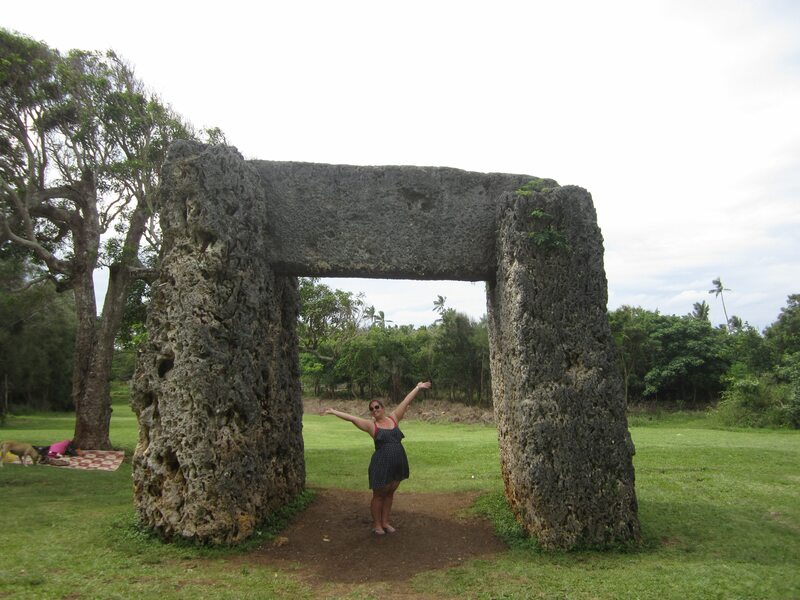 Third Stop – Trilithon (Stone Arch): The trilithon also known as Ha’amonga ‘a Maui (Burden of Maui), is a big square stone arch. 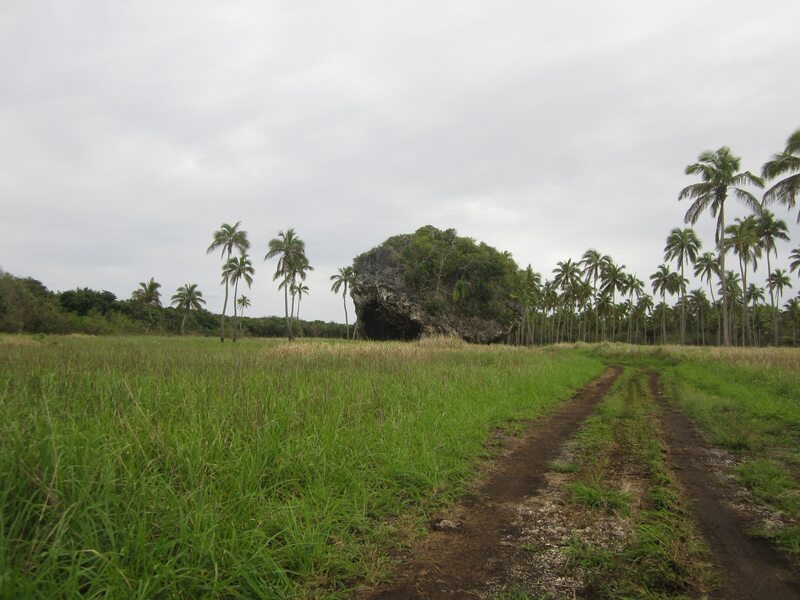 It was built by Tu’itatui, the 11th Tu’i Tonga in 1200AD. There have been many theories as to why it was built as no one really knows why. It has been speculated it is the entrance to a long gone royal compound, though this is unlikely. In 1967, the late King Taufa’ahau Tupou IV proposed that the notch carved on the top lintel may have had some significance in the lunar calender and served as a guide for establishing the beginning of a New Year. This now seems to be the leading theory about the site. There are a handful of vendors set up here selling their carvings and jewellery. They’re not overly pushy and are open to bargaining, but some of them do spend a lot of time creating the things they sell so I don’t feel great about trying to get things for next to nothing. 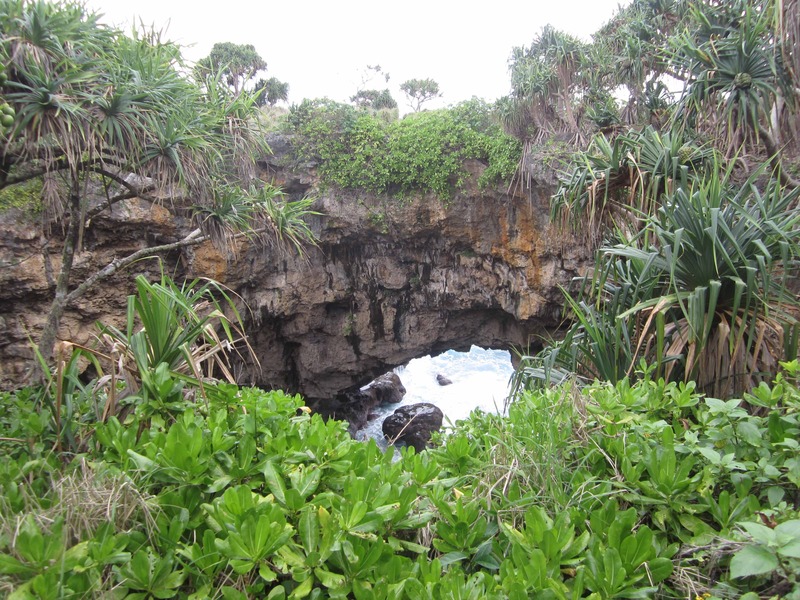 Fourth Stop – Natural Land Bridge: As we carried on around the island and left the main road, we began to encounter some monster potholes! They were HUGE and we had to slow right down to about 30-50km/hr, Shane was swerving all over the road to avoid them. Eventually we made it to the next stop: the natural land bridge It is located right on the cliffs looking out over the ocean and is super impressive! Just in case you’re not aware – a natural land bridge occurs when part of a cave roof collapses, exposing a large hole over part of the cave. In this one, the ocean still crashes in and out of the cave so the sound is deafening. We walked across the land bridge and found a short path that took us to the edge so we were able to look out the entrance of the cave (under the bridge) and watch the waves rolling in. Because the land bridge is so close to the cliff face, we spent a bit of time wandering along the top of the cliff, watching the waves crash into the rock face below. We even caught site of a couple of whales off the reef from up here, and we spent awhile watching them slowly move past. 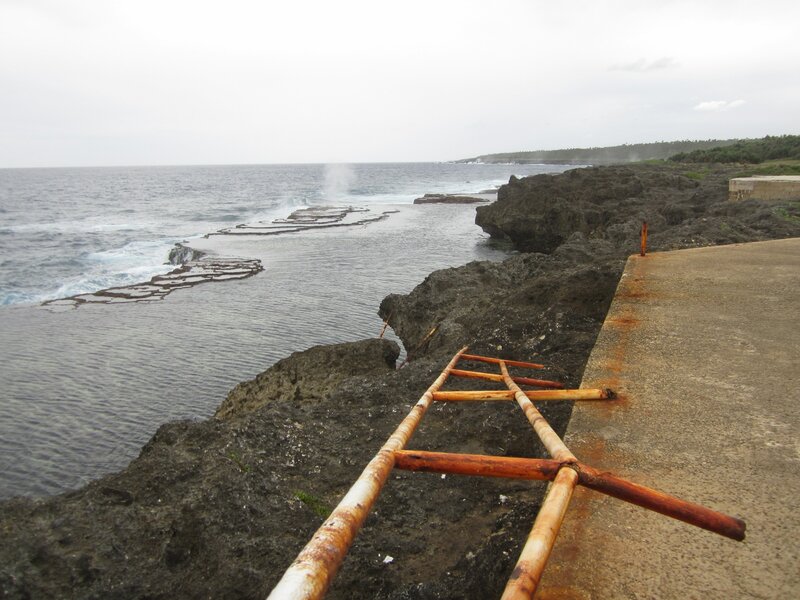 Fifth Stop – The Blow Holes (Mapu ‘A Vaea): Mapu ‘A Vaea means Whistle of the Noble, and they are really cool to watch, especially when there is a big swell coming in. The power of the wave pushes the water up through small cracks and holes in the rocks, sending big jets of water up into the air, like a geyser. We didn’t need long here either, but make sure you stay long enough to watch a chain reaction of geysers come up in a row along the rocks. They look really impressive! 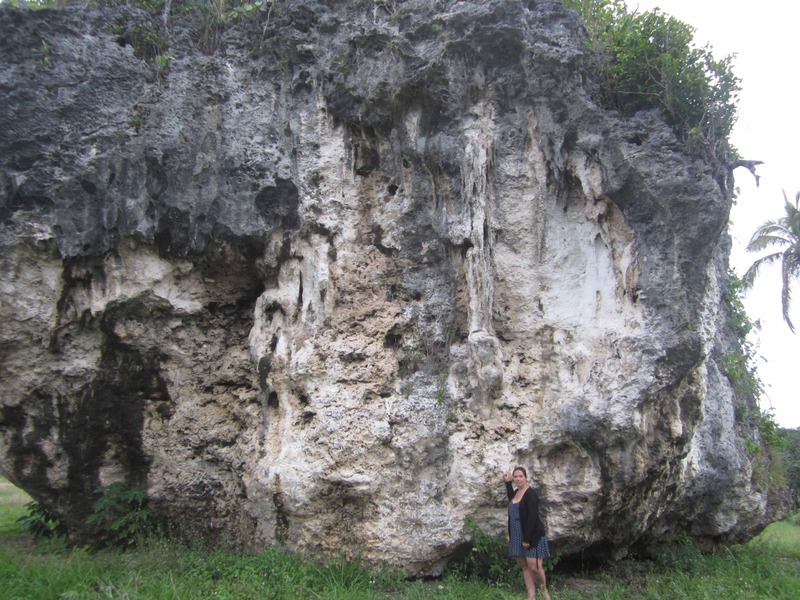 Final Stop – Maui’s Rock: This is a giant piece of coral that was blasted up from the reef into a paddock a few hundred metres away from the beach. There are actually a couple of these in the paddock but Maui’s Rock is the biggest one. We were told that no one knows for sure how they got there, but there are legends that explain it. The most likely explanation is that a powerful tsunami hit the island before it was inhabited by people, and broke apart the reef, scattering giant pieces of coral across the shore. It is truly massive! I wasn’t actually prepared for just how large it was, thinking it would be the size of a large boulder but I was totally wrong. We found a shallow cave underneath the rock that one could squeeze into and I could see remnants of a fire so I’m guessing people go there to hang out and eat shellfish as there are loads of shells around the rock. There are a couple of different islands (Atata, Fafa and Pangaiamotu) located close to Tongatapu that you can easily reach by ferry. They all have resorts on them but they except day visitors and as with Pangaiamotu, the ticket price includes the ferry and lunch. We decided to visit the Royal Sunset Island resort on Atata Island. We paid TOP$75 per person and this included the ferry, lunch and a glass of bubbles upon arrival. Atata Island is also inhabited by a small community in the middle of the island, which we were able to visit. It is a lot more run down than the mainland but the people were really friendly and some children came out to talk to us as we walked through the village. There are no shops, except for one or two roadside dairies so don’t expect to be able to purchase any souvenirs. We were able to go snorkeling from the beach, plus someone took us out to the reef where we could see a lot more sea life. Unfortunately, we only had about 30 mins on the reef, which wasn’t nearly enough time for either of us! It was a really sunny day, but there was a really cold wind so it wasn’t as enjoyable as we had hoped but it was still a really good experience. The food wasn’t too bad, it wasn’t as good as at Pangaiamotu but we had no complaints. There are three different cultural shows on the island, and all include a feast of local dishes. 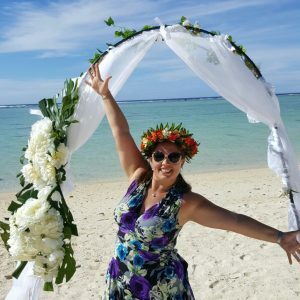 We went to two of them – Vakaloa and Oholei Beach Resort. Vakaloa: This one was pretty close to where we were staying so we booked for dinner on our first night on the island. The performers put on a really great show, lots of dancing, singing and storytelling, and the buffet dinner was very tasty. There were many local families here as well so it appears to be a popular thing to do on the island regardless of whether or not you’re a tourist; at Oholei the Prince of Tonga was there with his family! 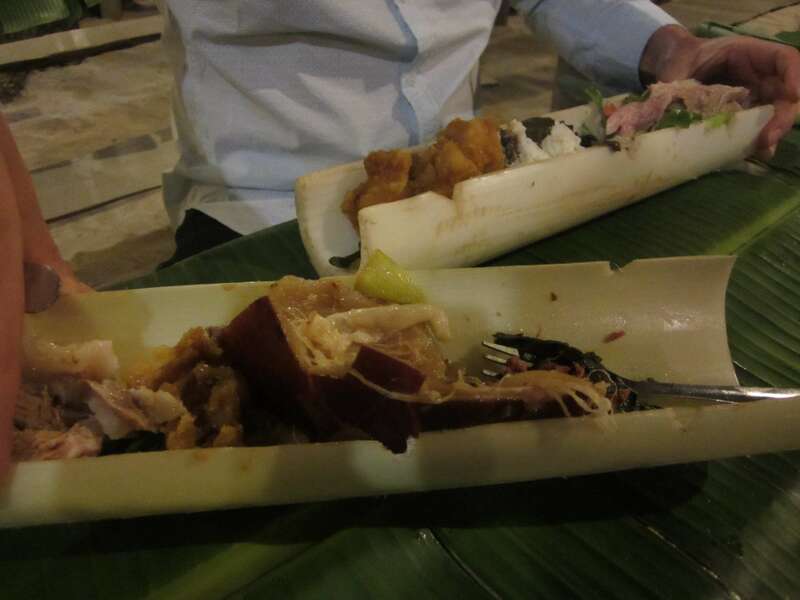 Oholei: This was the best one by far, the food was similar but it was served in the cut in half stalks of some plant (maybe Taro?) rather than plates which was quite unique. Though that is the only unique thing about it! They hold their show in a cave on the beach below the resort!! This was a really different experience that was started around 50 years ago by a local entrepreneur and his family, who still run it today. We stayed at White Sands Beach Resort, which was a little dated but still really nice and the staff are really friendly. Our bungalow was right on the beach, so it was only a short walk down to the water’s edge, and during the whale season you can see the humpbacks as they cruise past the reef. Breakfast was also included in our rate though we didn’t actually know this until the first morning when they suddenly turned up with a cooked breakfast. It definitely wasn’t on our booking confirmation, so if you do stay here, you might want to ask about it when you arrive. Lunch and dinner are also available, at a cost, if you want it. Vakaroa, where the cultural show is, is also a resort right on the beach just a little bit north of where we stayed. It’s also a great place to see the humpbacks playing outside the reef. There are plenty of hotels, B&B’s and resorts dotted around the island so it shouldn’t be too difficult to find something! How did we get around Tonga?? We hired a little car from a local car rental place that I found online – STAR Rental and I highly recommend them! They don’t have a website, only a Facebook page so you have to contact them via messenger but they’re really prompt at replying. They were very friendly and super laid-back and were happy to meet us at the airport to drop off/pick up and they had great rates which is fantastic when you’re on a budget! If you’re not comfortable going with a lesser known company, a lot of the global car hire companies are also available on the island but they’re usually quite expensive. But … you haven’t mentioned food!!?? There are plenty of places to eat in Nuku’alofa and we checked out a couple of different places. Friends: This is the main restaurant we went to, which is also a cafe so it’s open from quite early to quite late. The food was OK, the coffee was good and the price was reasonable. They also offer free WiFi, which was the main reason for us to go there. Marco’s Pizza & Pasta: We also checked out Marco’s one night for something different, and there are so many different types of pizza to choose from! They have a little outdoor seating area which looked quite nice but it was a bit chilly they night we were there so we opted to sit inside. 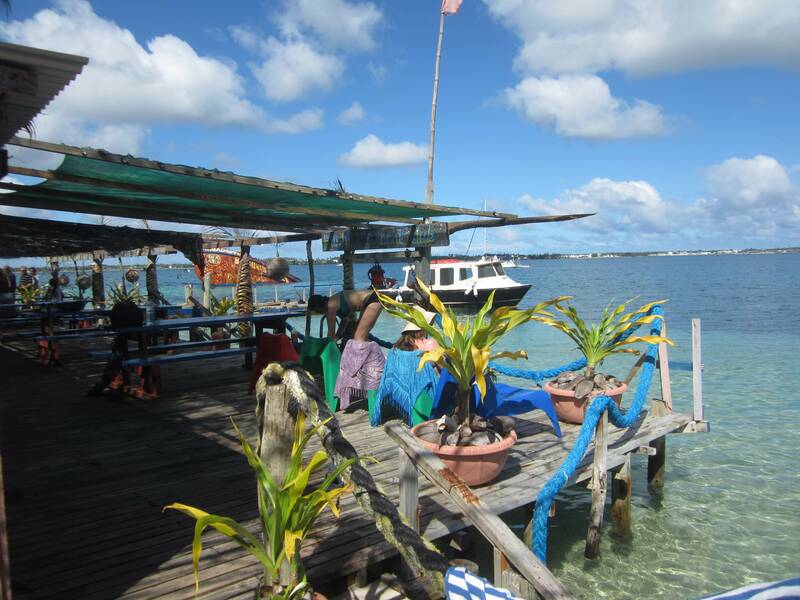 The restaurant is run by Marco, who is Italian and his Tongan family and they were all very friendly. Waterfront Restaurant: The food here was amazing! It’s a bit pricier than the other places, but definitely worth it. Located along the waterfront in Nuku’alofa, they also have a boutique hotel upstairs – though I’m not sure what their prices are like. 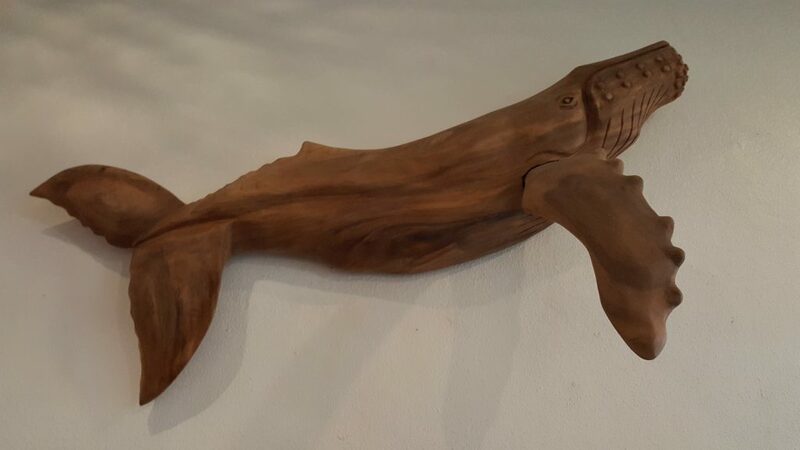 All the wooden carvings here are from a local wood carver who has a workshop not too far from town where you can go to purchase items. What else should I know?? Flying Foxes: Tonga has another mammal that is often spotted in the evening skies – Flying Foxes! They are EVERYWHERE! Flying foxes are a type of fruit bat and are often seen flying around at dusk, but we did see some during the day as well so it’s clearly not a hard and fast rule haha. We had a lot of fun spotting them and trying to get photos of them, which is not that easy as they don’t stop moving long enough, no matter how many times I told them to sit still! Tonga is OLD!! : Tonga has been inhabited for about 3,000 years, a lot longer than many of the other Pacific Islands. 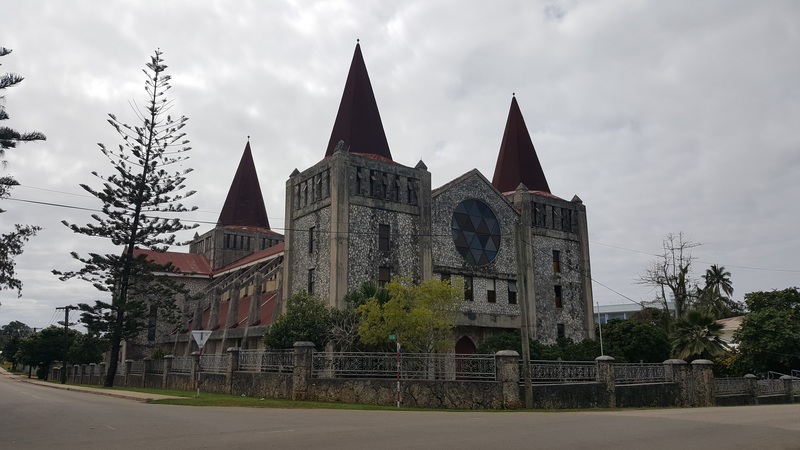 There is very little that remains from that period, most of the historic sites dotted around are from much later – 1,200 – 1,000 years ago when the island came under the rule of the first king, Tu’i Tonga. 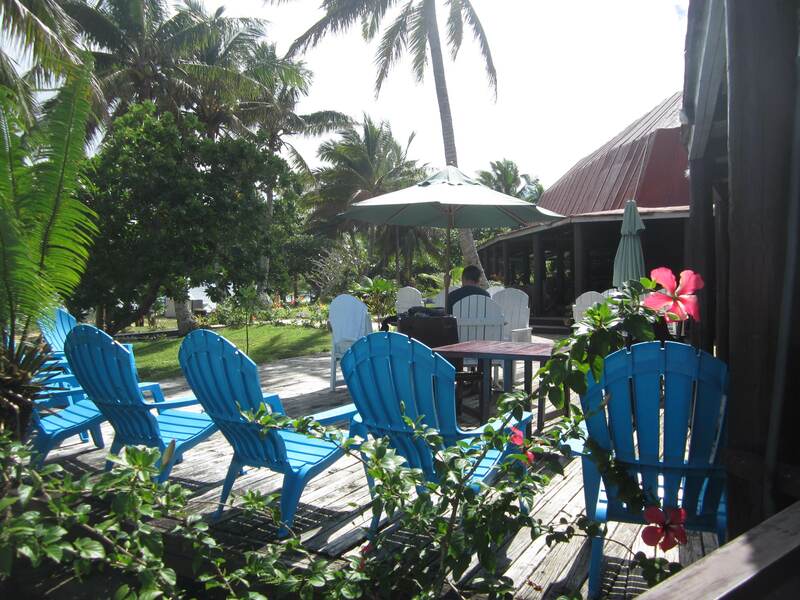 It’s super chill: Tonga is a very relaxed sort of place and the people are laid back and friendly. If you get lost (which is possible with all the dirt roads), the locals are always happy to help point you in the right direction. Souvenirs: The main place to get souvenirs is at the market in Nuku’alofa. To be honest though, we weren’t super impressed with these; they looked like they were mass produced and we wanted something a little more authentic. 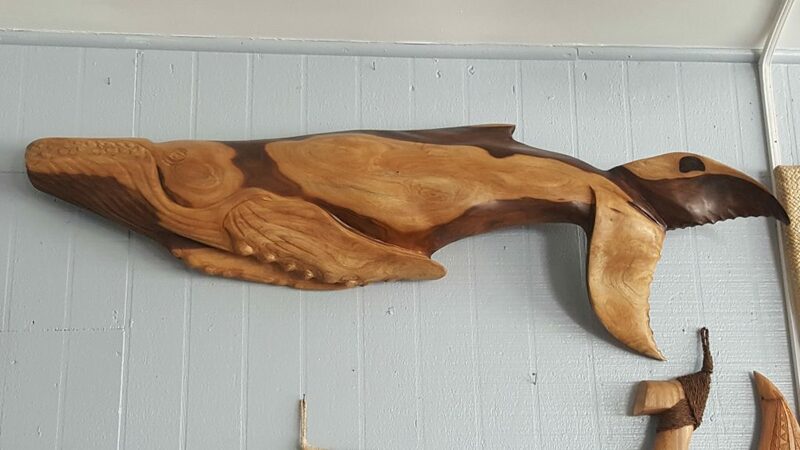 We managed to find a local wood carver (the same one who has carvings at the Waterfront Restaurant) who actually came to pick us up from town, and take us to his workshop to have a look around. His pieces we amazing and we spent way too much money here but it was totally worth it! He even gave us a tour around the place and showed us some of the pieces they were working on at the time. Shopping: Nuku’alofa is really the only part of town that has any shops. Though, there are loads of little roadside dairies that are open til quite late (like midnight). They’re interesting little places – a single room with wide, barred windows and you ask the person sitting in there to grab everything you want. This isn’t easy when there is a language barrier as most of the shop owners don’t speak English or even Tongan! It is a cool island to visit and it really was a shame the weather wasn’t better while we were there – it was pretty windy and cold most of the time we were there, which is unusual at that time of year. We still had fun, but it definitely could have been better with better weather! If you do go to Tonga, and you manage to locate the super tasty lemon bread (we had this on the whale tour, but couldn’t find it again), make sure you bring me back a loaf or 12! I love that stuff! The world is full of so many amazing places. Loved those wooden carvings – beautiful. Thanking for sharing! In nearly a year of travelling I’ve only met one person (well two, it was a couple) who have been to Tonga. It sounds like such a fascinating place to visit away from the standard tourist route. Thanks for sharing these ideas. 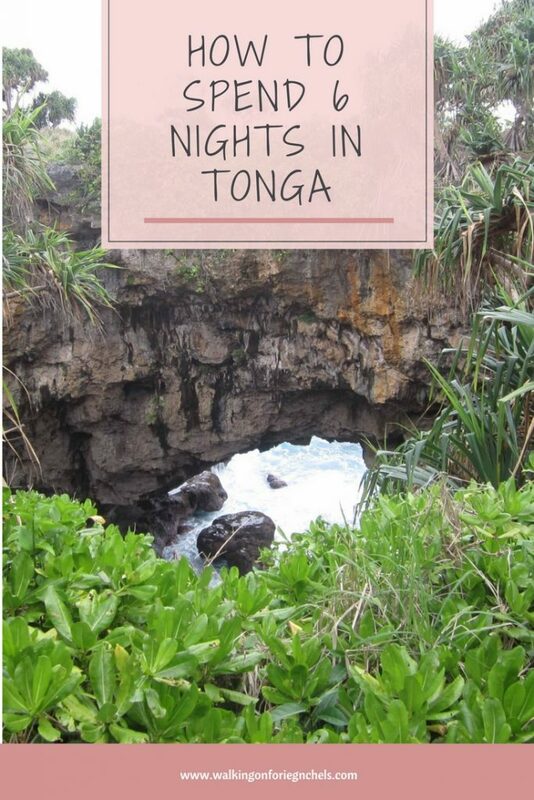 Such a great read, I don’t know anyone who has been to Tonga, it sounds so exotic and far away! Putting it on the bucket list to travel to one day. Oh this place looks like a paradise! I would love to visit. I very close friend of mine is from there so I should really go. Lovely article. Such an amazing and insightful article! Really love the pictures! Tonga looks like an amazing place to visit. It’s beautiful and has so much to explore. I’ll pin for next time. Tonga looks insane! The beaches and the food pictures have made me desperate to visit. Thanks for sharing such a well written article! We had not considered Tonga, until NOW! The water looked wonderful and Oholei is a must visit!! Have never heard of the Tonga islands! It looks beautiful! I would definitely see the whales but also check out a few other things you have listed! He land bridge and blow holes are sweet! Can you rent mopeds? Great article and very insightful. Love the details and photos! This is on my bucket list now! You have shared so many details about Tonga. The place has so many things to do that really one needs about a week to explore all. Thanks for this great article. Very interesting things you have shared here. 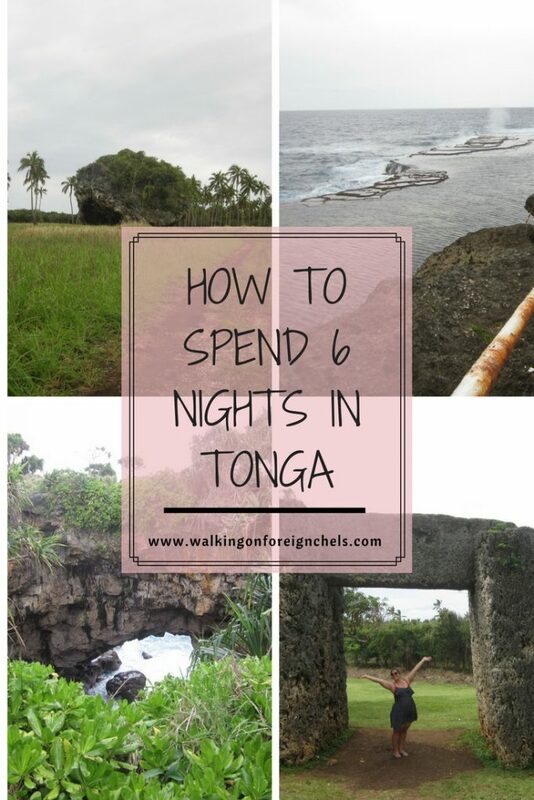 Great guide for spending wonderful time in Tonga. Thanks for sharing. Loved reading this post, I am planning to go next year, when is the best time to go when the weather is good? Do you know? Loved the beautiful photos, this looks like paradise. 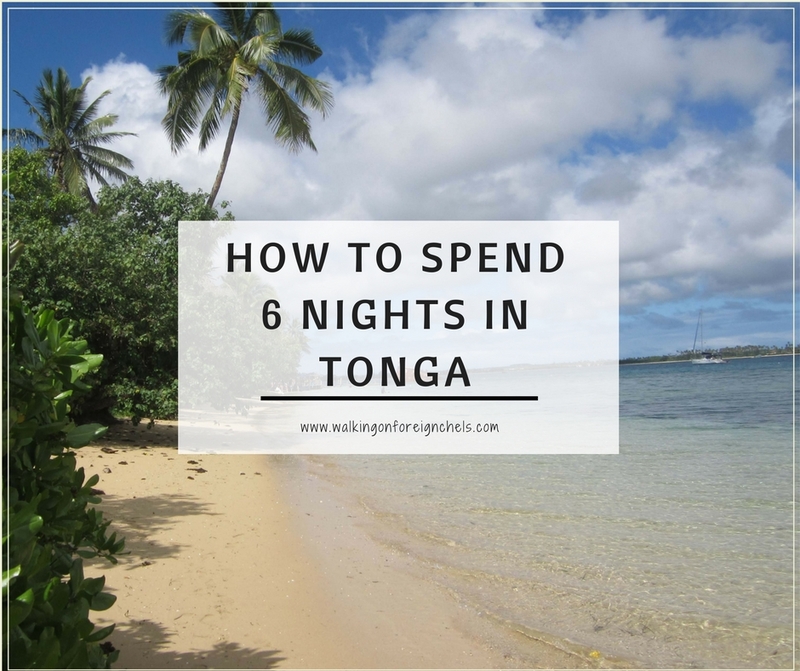 I read so much about Tonga islands this post just makes me want to go right now. The best time is their “summer” which is the same as the Northern Hemisphere, Jul-Sep. It’s drier and the temps are a bit lower so they’re more comfortable. Also, the humidity is lower at that time of year. Hope that helps and I can’t wait to hear about your trip! 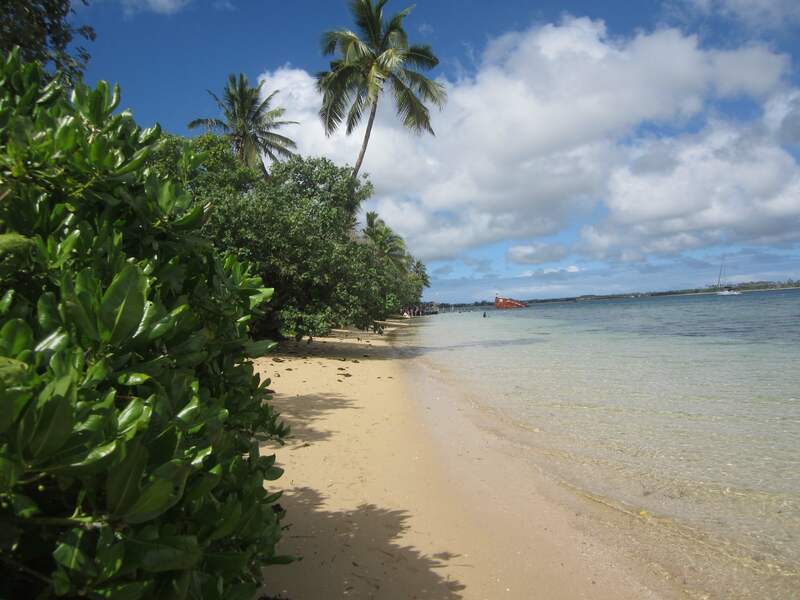 Going to Tonga is one of my greatest dreams, but it is so expensive from Europe. I know that their former king – who sadly died – used to study in Germany and was a big fan, therefore Tonga is sort of special here. When I read about New places I am excited as well as disappointed at the same time. Because I don’t think I will ever be able to see so much in one life. Tonga is beautiful and I hope I get a chance to see it someday.